DeZoZoo (pronounced DEE-zoe-zoe) is an acronym that stands for “Dead Zone Zooplankton”. 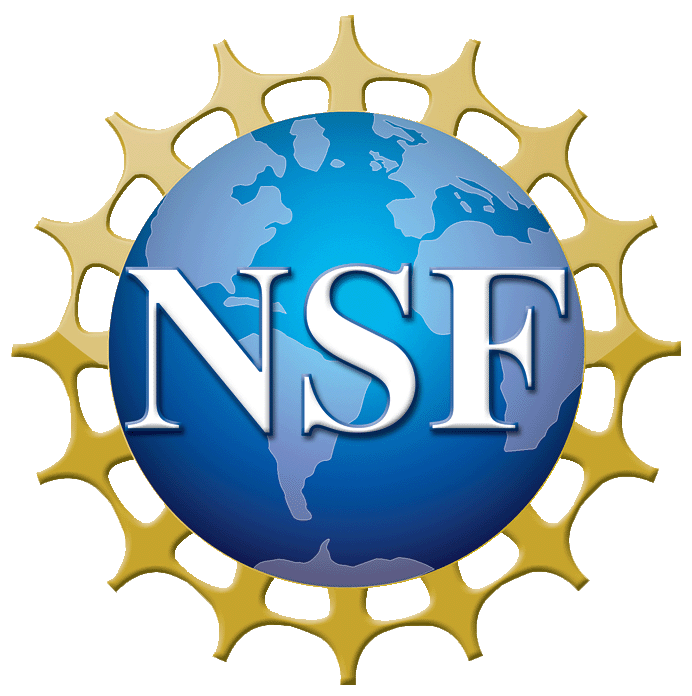 This is a research project funded by the Biological Oceanography division of the National Science Foundation (NSF), aimed at understanding how zooplankton are affected by low oxygen (hypoxic) conditions in the Chesapeake Bay. Zooplankton play a central role in aquatic ecosystems, as grazers of algae and food sources for larval and forage fish. Conceptual diagram of potential changes to zooplankton vertical migration under hypoxic conditions. Most of what we know about zooplankton is based on measurements of populations, usually collected using nets and acoustics or optical systems. We endeavor to link those methods to measurements on individuals and rate processes to better understand how behavioral and fitness changes in zooplankton may be affected by hypoxic conditions. However, in order to definitively explore how hypoxic conditions affect zooplankton, it is important to rule out the effects of other ecosystem components. Thus, this is a collaborative project, including experts in the fields of microzooplankton, gelatinous zooplankton, and larval fish. In addition we are taking a comparative approach, by sampling regions of the bay with varying oxygen concentrations but which are similar in other aspects (e.g. temperature, depth, and salinity), and sampling at different times of the year as hypoxic conditions change. The occurrence of low-oxygen waters, often called “dead zones” in coastal ecosystems throughout the world is increasing. Despite these increases, the pelagic food-web consequences of low-oxygen waters remain poorly understood. Laboratory research has demonstrated that hypoxic water (< 2 mg l-1) can result in mortality, reduced fitness and lower egg production of planktonic copepods, a major link in food webs supporting pelagic fish. Observations in the sea indicate that hypoxic bottom waters usually have depressed abundances of copepods compared to normoxic waters (> 2 mg l-1). The gradient of declining oxygen concentration with respect to depth (oxycline) can be a critical interface in coastal pelagic ecosystems by altering the migratory behavior and depth distribution of copepods and their spatial coherence with potential predators and prey. We propose to develop a mechanistic understanding of how behavior and fitness of copepods are affected by hypoxia. We will compare bottom-up and top-down controls on the ecology of copepods in Chesapeake Bay waters experiencing seasonal hypoxia and those that are normoxic. 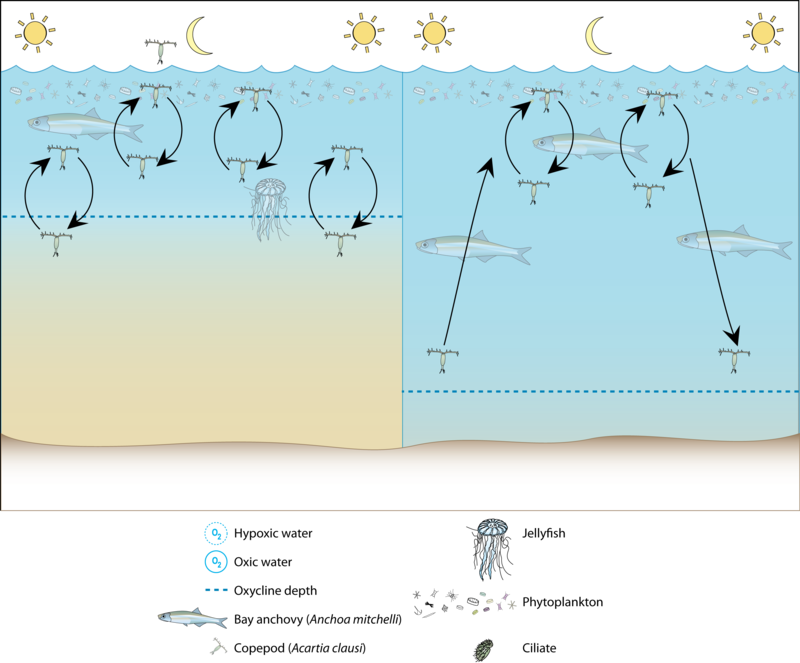 Specific objectives are to: 1) analyze changes in migratory behavior and fine-scale (meter) distribution of copepods across the oxycline over hourly and diel time scales while simultaneously examining the distribution and abundance of their food (phytoplankton and microzooplankton) and predators (fish, gelatinous zooplankton); 2) estimate effects of hypoxia on the “fitness” of copepods using a suite of measurements (length/weight ratios, feeding, egg production, and egg hatching success) to develop condition indices of copepods captured at different times and depths in hypoxic and normoxic waters; and 3) evaluate effects of hypoxia on copepod mortality by hypoxia-induced, stage-specific copepod mortality in hypoxic bottom waters and by changes in top-down control of copepods from predation by fish and gelatinous zooplankton.